Pasta with butternut squash and sage | eat. live. travel. write. Gourmet Unbound is a group of bloggers saddened at the demise of the magazine who have banded together to keep the spirit of Gourmet alive. You can read about the project here but basically you choose a recipe from any year of Gourmet magazine for the month ahead, make it and post it by the first of that month and the Gourmet Unbound team will post a recap of those who participated. 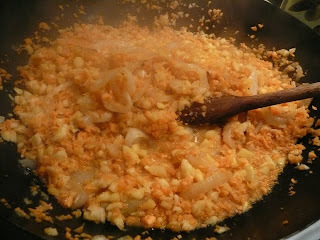 Cook onion in oil in a large nonstick skillet over moderately high heat, stirring occasionally, until golden. 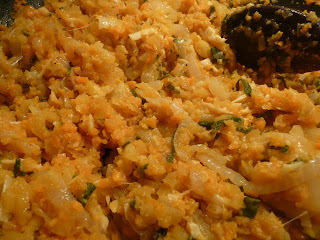 Finely chop squash pieces in a food processor (ok, embarrassing confession here – I ALWAYS forget about using the food processor when I have masses of veggies to chop. This was a revelation to me. Sigh. I guess you CAN teach an old dog new tricks, right?) 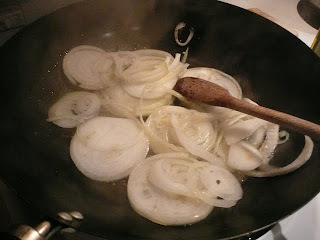 and add to onion with water and salt to taste. 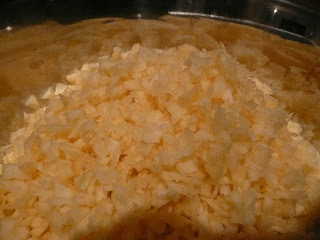 Simmer, covered, stirring occasionally, 15 minutes, or until squash is tender. Add sage and simmer 1 minute more. Cook pasta in a 6-quart pot of boiling salted water until al dente. Reserve 1 cup cooking liquid in a cup and drain pasta. 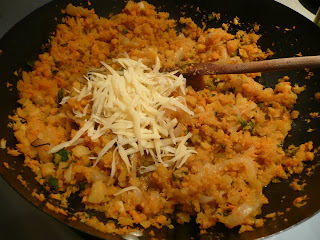 Return pasta to pot and add squash mixture, parsley, the cheese, butter, and plenty of freshly ground black pepper (I actually added the cheeses to the squash mixture before I added in the pasta), stirring until butter is melted. (Sigh – I forgot the parsley…). 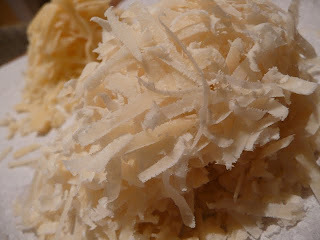 Season with salt and add some of reserved pasta cooking liquid to moisten if necessary. 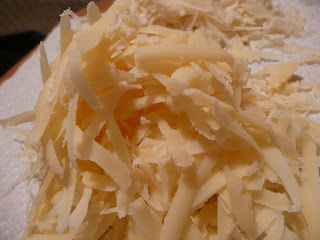 Serve sprinkled with additional parmesan. 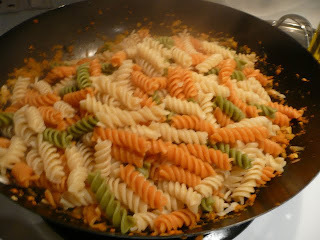 This was a nice light pasta dish that tasted a lot richer than it was – always a good thing! 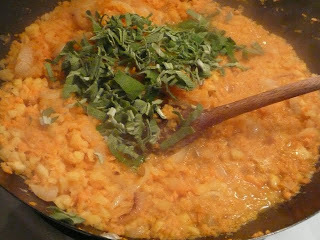 I wish I had not forgotten the parsley – next time, maybe! In any case, I will be adding this to my repertoire of fall/winter pasta dishes. Bon appétit! I'm also terrible at remembering I own a food processor. 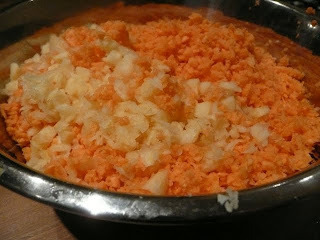 I hand grated a thousand carrots the other day for carrot cupcakes. Perhaps we should leave super obvious messages on post-its around the kitchen for ourselves – "use the food processor you fool", "don't forget to add all the ingredients to the dish", "you own an apron, why don't you ever use it?" etc.This looks like a great cool weather dish, but makes me realise I can't remember the last time I ate something with parmesan cheese. I endeavour to attend to this terrible oversight tomorrow. 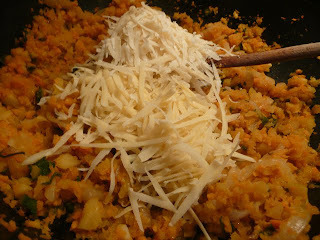 The butternut squash – sage combination is one of my favorites, lots of flavor and not too heavy. This a cool idea, I have to check it out. Great recipe choice! YUM. I love anything butternut squash.Also, I never use the food processor to chop things. It's partly because I only have a small one (base trades out with the blender) but also because I'd rather take the time to chop than clean a food processor! Butternut squash and sage is such a great combination! That is making my mouth water, it looks fabulous. I never use the processor to chop things either. It's faster to just clean the knife! Conor – you've got the BEST ideas!!!! 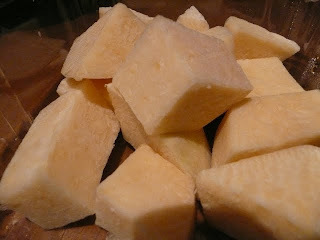 😉 Get right onto that parmesan…Cathy – that's what I loved about this dish too.Tasty Trix – thanksMegan – I guess it's good if you are short on time as I was for this recipe but there is definitely something very satisfying about chopping with a knife…My blissful bites – isn't it? :-)Janet – Sometimes it's ok to use the processor – especially if you have a lot to chop and no counter space but yes, you're right re the cleaning. YUM! this sounds absolutely amazing!!!! Gourmet Unbound is such a great tribute to the magazine. Congratulations on being in Canada for 10 years! I love brown butter and sage with squash ravioli, so I bet I'd love this. And it's faster than the wellington. 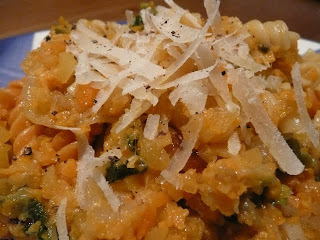 Oh how I adore the combination of butternut squash, parmesan, and sage. One of my favorites! Looks beautiful. This looks really wonderful. I've made ravioli with squash before, but I've never really just put it over pasta. Wonderful looking dish! Jordana – it's very festive!Simply Life – it was.FLB – thanks! I can hardly believe it myself!Diana – you're welcome!Kablooey – yes this is a nice twist on the ravioli.Jen – thanks.Natalie – absolutely!kate – I know, I had never thought of doing that either! This looks great! Thanks for participating! Maggie – I think it's a wonderful "challenge" to participate in and keep the legacy of Gourmet alive! Also might make me actually go through some of my hundreds of magazines and get to cooking out of them instead of just bookmarking them "for later"!